Easy, because we practically do nothing. Hard, because we fight the mind. Some people think meditation takes time away from physical accomplishment. Meditators, however, find that sustained meditation creates more time than it takes. because of the effect you will have on those around you - you make the world a better place. "Meditation is your daily life without any outside influences. To have that sense of total freedom, to deny everything ... to deny your gods, your sacred books, your traditions, your beliefs, everything wiped away ... which means you are totally independent. When the mind is totally free from all psychological accumulation, when the mind has become absolutely quiet, that illumination is to see things clearly as they really are … that is meditation"
when all activity has ceased ... that's what meditation is." Some say meditation is much underrated ... and can't be overrated. 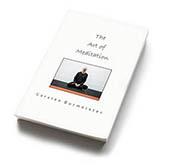 My THE ART OF MEDITATION is a how-to guide of my method, which does not follow any traditional meditation regime ... rather it's an accumulation of my own experiences, augmented by thirty years of (informal) studies. The closest to a formal meditation 'technique' in my approach would be that I use Zen principles; for my take on Zen download my ZEN essay. So what is meditation? Why would one want to meditate? There are two aspects of meditation, (a) it calms and relaxes us, it potentially elevates us above the turmoil of our daily lives ... that primarily is the Western outlook; (b) meditation can be more, where it does the above but then advances us to a loftier goal, that of enlightenment ... this is the Eastern perspective; in THE ART OF MEDITATION I attempt to address both aspects. Listen to this 10min TED talk on doing Nothing; it is about the Western interpretation of mindfulness meditation, where we mentally step back and the mind - in fact every single thought - is observed ... is witnessed as it comes and goes. This is done in order to apply the notion of 'Living in the Here and Now', the present moment. With my approach to meditation I wish to outline a way of ultimately going further than simply observing the mind. But what does all this mean on a practical level? When we venture into meditation as beginners, we start with a scattered, restless mind. Our thoughts dart all over the place and we have very little control over them ... if any. This is the first stage in our meditation ... we want to progress from here as quickly as possible. The next stage is mindfulness, when we observe mind and concentrate on the breath; the third stage is to still or empty the mind. Unity Gym meditation classes were held each month on the first 4 Saturdays at 12:00; register your interest and sign & hand in this disclaimer. In every class I say a few words ... if you join once the course is underway, download the documents with the transcripts of the Course Contents you have missed (I also hand them out at the beginning of every course). If you're unable to join the course, you may wish to buy the course booklet. In any case, bear in mind that my little The Art of Meditation book contains nothing more than what is on this page; it is little more than a 'souvenir-edition', or indeed a gift you may wish to bestow on a friend. Furthermore, all my writings on meditation are non-copyright, they are open source ... you can use them which ever way you want to (having said that, it would be nice if you linked back to this page for me). The purpose of true meditation is to still or empty the mind; this is arguably the most difficult task there is, hence the practice is more of a journey than a destination. But what is the concept behind the ‘empty mind’? When we analyse the world and assess ‘reality’, we will necessarily form our opinions and beliefs with referencing our very own world-view … and for most of us it's near impossible to see the world from a different view-point than our own. The instrument with which we do this is our mind. In talks and discussions we readily invoke the ‘Power of the Mind’ … which truly is awesome. But the mind has powers that work against us: Mind can create bias and bigotry, fear and disillusionment as well as anxiety, stress, depression and disease. At times - when we want to ‘get real’ about where we stand in the world, where we stood in the past and where we want to go - we want to clear our restless mind and allow ourselves mental inactivity, respite, time-out ... that way we can create space for new ideas, new directions, new undertakings, for potentially calm, clear, unbiased thinking. Indeed, there is scientific evidence this process brings us closer to our goal of inner peace ... meditation is the key to this process.